PALEO JAY SMOOTHIE CAFE: Paleo diet and the importance of SLEEP! Here is a brief info-graphic I found at Paleoliving.com; the accompanying article is quite long, and will tell you in detail just why sleep is so important, and how we have so disrupted our necessary and primeval patterns of sleep and rejuvenation. But, the diagram above really puts it all together succinctly! What you really need to know and to incorporate into your life is that sleep is not something that's optional- chronic skimping on sleep, meaning less than 7 1/2 -8 hours per night, minimum, will quite literally KILL you! The rejuvenating effects of good, restful sleep are completely necessary for mental and physical health. 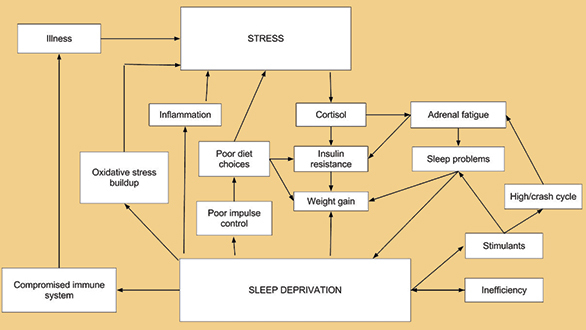 Lack of sleep is extremely stressful- your body cannot take it- we were made to require sleep. Just as we require good, high quality Paleo foods, and brief yet intense exertion, we require good, high quality sleep! It is really that important to our health. Black out your bedroom! If there are bright lights outside, get heavy curtains that really block that light. Don't watch TV or use a computer in your bedroom. Try to make it the "sleep cave". Don't stay up late! This is crucial- we are meant to go to bed with the onset of darkness, and awaken with the dawn. Try to replicate this cycle as much as possible! Don't eat late in the evening! Digestion is a big chore/stresser on your body, and will make it harder for you to sleep. Above all, don't be a "Hero"! Don't be someone who prides himself on "only needing 4 hours of sleep a night! ", implying that you are so tough you don't waste time on something as nonproductive as sleep! This is nonsense, and you are only fooling yourself- just as you could "get by" eating the most non-nutritious diet; i.e. fast food and soda for awhile, we all know that eventually this will literally destroy you! Same result with cheating on SLEEP!